The 16 individual Côtes du Rhône Villages fall within three departements: the Gard on the west of the Rhône, the Drôme to the north-east, and the Vaucluse at the heart of tourist Provence. Above: the southern Rhone Valley. The 16 Côtes du Rhône Villages are marked in yellow, the more famous 'Crus' in red. The rest of the area marked green goes into regular Côtes du Rhône wines. It was back in 1953 that the French Appellation Controlée body first allowed four communes (communities) to append their name to Côtes du Rhône Villages. Two of those villages (Cairanne and Gigondas in the Vaucluse) have gone on to amply justify themselves. The other two, Laudun and Chusclan in the Gard, have consistently struggled to do so. LAUDUN (1) has one certifiably excellent wine maker - Luc Pélaquié of Domaine Pélaquié - but his best bottling is actually his white. (Read more about it here.) Pélaquié make an impressive and inexpensive Côtes du Rhône Village Laudun red, but it's not noticeably better than his other reds. And there isn't much else from Laudun that makes it out of France. One exception is the Chateau Saint-Maurice Cuvée Vicomte Guillaume De Joyeuse 2000, picked up for $10 in the front bins of a low-rent wine store in Brooklyn, which lacked complexity but was bright, forward, fruity and thoroughly enjoyable, with some earthiness and spice. Certainly great value for the price. Eric Texier has helped "resurrect" some obscure Côtes du Rhône Villages. As for CHUSCLAN (2), even back in the 1950s it was mainly producing rosé wine, and it's still dominated by the old-fashioned co-ops. I couldn't even find a wine from Chusclan for my first feature about Côtes du Rhône Villages - but that was before Eric Texier came on the scene. Texier, a former nuclear physicist turned top-notch Rhône negoçiant, has almost single-handedly set about resurrecting the most obscure of Côtes du Rhône Villages, and his Chusclan proves the wisdom of his decision. The Texier 2000 Chusclan was an immediate winner at a tasting we held in late 2002; for this we could credit its relatively restrained, forward approach, and for that subtlety we could certainly thank its 50% syrah content to balance the equal amount of grenache. The wine has nice aromas of blackberry and lightly grilled meats, vibrant acidity and unobtrusive use of oak. It's priced lower than some of his other Villages wines and makes easy drinking. Texier bottles a Laudun (I believe the 2001 is his first vintage, I've yet to taste it), and no less than two wines from neighboring ST. GERVAIS (3), third of the Gard's Côtes du Rhône Villages. His Vieilles Vignes is 95% Grenache from 80-year old vines - which made, in 2000, for a high-alcohol package both brawny and brainy. It's an excellent wine with everything in order, but something to be stored away for a few years if you want to enjoy it properly. I've noticed the 2001 is down to 13.0% alcohol; it may be that Texier is trying to reign in his wild tendencies. St. Gervais is also home to the highly regarded Domaine St. Anne. Their 1998 proved perfectly balanced, very clean and attractive. A review of the '99 (at $16, among the more expensive Villages wines) on Ann Arbor store Village Corner's web site calls it "Full, spicy, ripe," with "Racy acidity, good extract, fine tannin" that "Clings and lingers." It's hard to argue with such a welcoming description. Domaine St. Anne, whose white Côtes du Rhône is a 100% Viognier, is also one of the few producers well known for a Côtes du Rhône Villages wine that comes without a specific Villages name. (Read more about such wines here.) Their Cuvée Notre Dame 1999 offered a forward nose of sweet Grenache fruit, some lovely floral flavors that I wrote as 'rose petal' for some reason, and it was unquestionably opulent, but the alcohol (14%), fruit and tannin held together in marvelous balance. Returning to it 24 hours later found it exceptionally smooth: proof positive that you don't need a specific village name to drink great Côtes du Rhône Villages - you just need to know of a good producer..
As well as these three Côtes du Rhône Villages, the Gard is home to two towns with their own unique Appellation. Tavel I've already written about (it's the only appellation in France that produces nothing but rose wine) while the wines of Lirac are comparable to Côtes du Rhône Villages, but given their particularly impressive flavors (at excellent prices) they warrant a separate Appellation. I'll cover them another day. The Drôme is home to a handful of forgotten Villages, with limited plantings and even smaller reputations: ROCHEGUDE (4), ROUSSET LES VIGNES (5) and SAINT-PANTALEON LES VIGNES (6). Don't worry about them. Concentrate instead on VINSOBRES (7). ("The village is on a hill. Its land bears a soft and piquant wine. Whether Vin Sobre or Sobre Vin, drink it soberly," said Monsignor Archbishop of nearby Vaison-la-Romaine back in 1633, and the oxymoron stuck. ) Vinsobres sits at an altitude of 400 metres, by far the highest of all the 16 villages, but its hillside vineyards are perfectly placed to get both maximum benefit and protection from the Mistral and Alpine winds; with 572 hectares under vines, Vinsobres is also the most planted village alongside Cairanne. A few Vinsobres producers have garnered a reputation over the years, among them Domaine de Moulin, Domaine les Aussellons and Caves C.N. Jaume. But perhaps the most promising name in the town is that of Valerie Chaume-Arnaud, who exemplifies the ambition of many a young French winemaker - when her parents' disputed her assertion that they should be estate bottling their wine rather than selling the juice off to négociants, she rented the vineyards from them. I've had some conflicting experiences with their '98s, but generally speaking  and allowing for their excellence with their white wines and generic Côtes du Rhône Villages bottlings  Chaume Arnaud is a name to rely on. The Vinsobres packs around 75% Grenache for somewhere close to $15. Look also for Domaine Gramenon, a heralded producer of high-end Côtes du Rhônes wines now bottling from selected Villages. (I'm yet unsure if the family owns the vines or is serving as négociant.) Their Vinsobres wine is labeled Les Hauts du Gramenon, it comes in a deliberately browned label, and it has a deep-purple-ruby sheen, a lovely dark fruit nose with a touch of earth but some violet too, a good medium-full body with a healthy dose of acidity and a textured, soft finish. Nothing too tannic or abrasive, just well rounded, attractive and ready to drink now. The last of the Drôme Villages, SAINT-MAURICE (8) has generally struggled for attention. For years, only Domaine de Deurre garnered any kind of reputation. Yet in the past couple of years, as indication of the revolution gripping the region, a small family producer Domaine Viret has put the Village back on the map in a most distinctly up-to-date manner. The elder Viret, Alain, designed (and here I quote the importer, LouisDressner's web site) "a viticultural method by mixing old-fashioned vineyard practices and his belief that our environment is influenced by flows of energy from the planets and constellations. He named this philosophy cosmoculture, because it is based on his studies of the Mayas and Incas, the greatest early farmers in the world. The briefest of description could be: a form of viticulture based on the principles and practices of bio-dynamie, with the addition of other energizing media, like standing stones and cosmic posts, which capture the planets and constellations energy and bring it to the vines and soil." You're welcome to call it mumbo-jumbo, but two conclusions are apparent now that the son has convinced the father to bottle their own wines: the label is as distinctive as anything emerging from the Rhône, and the wine itself is well worth searching out. The Cuvee Cosmic is an interesting blend of barrel-fermented Grenache and tank-aged Syrah and Mourvèdre; the Mareotis offers up the dark meaty smell of syrah as well as the sweet jammy aroma of Grenache, and while a little over-ripe on first taste (a common perception with some of these high alcohol Grenache wines in recent hot vintages), it also had an immediately alluring upfront attraction. Better yet, it matured in a stoppered bottle over the next couple of days. The caveat  and this is becoming increasingly common in the Rhône  is that the Mareotis is priced up there with some Châteauneuf du Pape, at $20-25 a bottle. Fascinating stuff, but not the reason I originally set about writing of the region, nor typical of Saint-Maurice's history. Within the southern part of the Drôme, the Vaucluse claims a little circular patch - the Enclave des Papes - which includes two Côtes du Rhône Villages to think of alongside Vinsobres. (See map.) The village of VISAN (9) has 286 hectares of vines, all apparently at least 50 years old, which would suggest that produce concentrated wines built to last. My lone experience, with the Olivier Cuilleras Visan Vielles Vignes, packed in an extra thick bottle as if designed to restrain the wine's content, has borne out this expectation. Grenache forms 90% of the content, with 10% Syrah making up the balance in 2000, and 5% Syrah and 5% Carignan in 2001. I almost recoiled at the nose of the 2000 when we opened it in late 2002: it emitted ripe earthy tones suggesting the most rural of vineyards, and I heard others around me talk of TCA. All considered, I think this was just opened prematurely: by the second night it was still enormous but somewhat better rounded. While it would make a good accompaniment to a hearty winter's meal right now, its cheek-puckering tannins suggest it will be a more enjoyable drink in years to come. I picked up a bottle of the 2001 with the intention of letting it age a couple of years. 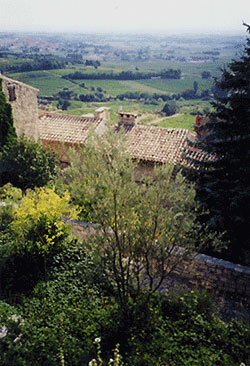 The village of VALRÉAS (10) offers more choice of producers and greater variety of flavors. The 1999 Domaine Deydiere, for example - 'distributed' by Domaine Gramenon - is gorgeous. Like its Gramenon-bottled Vinsobres neighbor, it has bright fruit on the nose rather than the earthy/garrigues smell of the Villages further south, and it's both luscious and opulent. In the UK I picked up a bottle of Clos Petit Bellane's 2001 100% Syrah under the cuvée Les Echelas, which I've yet to open. Le Val des Rois and Domaine des Grand Devers also have good reputations. And I have a distinct impression I've seen more Valreas on British store shelves than American. Newcomers to the whole Côtes du Rhône-Villages business may just want to remember V for Villages and try anything with that initial. Down in the Vaucluse proper lies the smallest of all 16 Villages and one of the least known, ROAIX (11). If its size suggests why we never hear of its wines, its location suggests otherwise. For Roaix is surrounded by some of the best vineyards in the southern Rhône. After all, Châteauneuf du Pape is in the Vaucluse. So are Gigondas and Vacqueryas. And so are the best communes within the Côtes du Rhône-Villages appellation. You can drive up from Beaumes de Venise, Sablet, Séguret, Rasteau and Cairanne in just half an hour, provided you don't stop off at the wineries en route, which is, admittedly a great temptation. BEAUMES DE VENISE (12), the furthest south of all 16 villages, is the dark horse of the area, its red wines often overlooked in understandable favor of its world-famous delectable sweet white muscats, which have their own appellation. Yet the reds can be extremely rich and long-lived. The 1996 from Domaine les Goubert (made from Grenache, Syrah and Cinsault) was a flavor-packed monster when sampled in February 2001. Full of sage, blackcurrant, cassis and barnyard on the nose, it was equally bounteous on the palate, yet still showing some astringent tannin. (I had uncorked a bottle a year earlier, which clearly required more time to settle, and demanded hearty strong food to soften it.) A bottle of the '97 opened the same recent tasting night was somewhat tighter on the nose, though noticeably lighter in body. We also had a 1994 from Château Redortier which was a little smoky and sweet, just turning the corner into old age, but demonstrating the Village's ageing potential. (Both Les Goubert and Redortier are based in Gigondas, where wines are built to last; it's no surprise that many of the best Village wines in the Vaucluse are bottled by producers based in the region's appellations Gigondas, Vacqueyras and Châteauneuf du Pape.) Surprisingly, a 1998 from the generally well-regarded Domaine Fenouillet was disappointing, revealing little of anything among any of the senses. A 2000 from Domaine Durban, one of the most renowned producers of the sweet white muscats, proved surprisingly simple but admirably balanced. Prices for Beaumes de Venise remain particularly sensible, usually under $15, perfect for experimenting with the Villages wines. Moving north and bypassing Vacqueryas and Gigondas (which we'll write about another day), one recognizes the hilltop village SABLET (13) by its bell tower (see right). Sablet is almost unbearably picturesque, with a gorgeous view of the Dentelles de Montmirail off to the east (the slopes of these tooth-shaped mountains yield much of the best Gigondas wines), and its wines are uniformly superb. They're also proving increasingly easy to find. Château de Trignon's Sablet is available in both the UK and the USA (where its 1998 made the Wines Spectator's top 100 list of 2000) and is as good a Village wine as you'll find. Domaine de Piauger produces three cuvees, of which its Le Montmartel 1998 can still be found in New York for a reasonable $15; 80% Grenache with 20% Mourvèdre from gravel soils on the hillside, it offers a surprisingly light color, a hefty fruity nose, with plenty earth and leather from the Mourvèdre as an unusual (and delightful) balance to the ripe sweet grenache. It outclassed a 2000 Châteauneuf du Pape at a recent tasting. Eric Texier and Domaine Les Goubert also bottle from Sablet, though I've yet to try either. Considering that Sablet was only awarded Côtes du Rhône-Villages status in 1974, it could rightly be called an over-achiever. Eric Texier has bottled a spectacularly strong Séguret this last couple of vintages. Packing a 14.5% alcohol punch, the 2000 had ripe flavors on top of ripe aromas, tannins so tough you could chew on them and left the impression it had stained my teeth by the time I was finally able to swallow it. 95% Grenache from 60-80 year old vines, it was too much for me under the circumstances, more like a baby Châteauneuf du Pape than a Côtes du Rhône. However, anyone wishing to experience southern Rhône wine in all its hot, ripe, sweet, opulent, high-alcohol flavors should make a beeline for this. Naturally, Robert Parker loves it. Finally, a transplanted Englishman, Walter McKinley, has been producing and exporting two cuvees from Séguret since the 1998 vintage under the name Domaine de Mourchon. They're priced under $20, and contain a relatively high proportion of Syrah; I look forward to trying them both. The big three Rhône négoçiants  Guigal, Jaboulet-Ainé and Chapoutier  have a near lock on basic Côtes du Rhône wines. That's encouraged newer, up-and-coming négoçiants to head further afield in the Rhône. Several of them are doing so by buying grapes from small producers among the 16 Côtes du Rhône Villages, families that formerly sold direct to the local co-ops; the négoçiants then blend the grapes and/or juice and bottle the results according to the Strict AC regulations. Patrick LeSec is a prime example. He refuses to fine or filter his sourced juice (which keeps it as true to its terroir as possible). In the last couple of years, Patrick LeSec Selections has started producing wines from both Cairanne and Rasteau, including probably the first white Rasteau to hit the American market. I'm on the look out for it. The Perrin family from Château du Beaucastel, whose Le Vieille Ferme Côtes du Ventoux is one of the most inexpensive popular southern French wines in the world, has recently expanded its Côtes du Rhône operations into Rasteau and Vinsobres. Two others among the very best of Châteauneuf du Pape producers, (Laurent) Feraud and (Andre) Brunel, have teamed up under their last names to produce wines from Cairanne and Rasteau; their individual reputations as producers ensure that these new bottlings will sell quickly. Meanwhile, the highly regarded Gigondas producer Domaine Santa Duc has understandably looked around his neighborhood and begun bottling reds from Cairanne and Rasteau (and a white from Sablet) under the négoçiant label Santa Duc Selections. blockbuster (whose) tannins may never become fully absorbed." Finally, back down at the preferred, lower end of the price bracket, Gabrielle Meffre, whose La Chasse du Pape Côtes du Rhône has become a benchmark in the UK, seemingly more popular than Guigal or Jaboulet, has decided to expand on these wines' popularity by producing wines from Cairanne and Rasteau as well. It's hard to blame him. These are two of the best Villages wines in the world. Eric Texier does not yet produce a Rasteau, but having added a Cairanne to his portfolio in 2001, he now produces from six of the 16 Villages. In addition, he's unearthed an almost entirely forgotten Appellation from the border between the northern and southern Rhône. Wines from Côtes du Rhône Brézème (not part of the Villages appellation) are 100% Syrah; in Texier's hands, they come with unusually high acidity, especially in the Vieilles Vignes Cuvée, which Texier understandably recommends you store for a few years. Further confusing the issue, Texier has bottled a Côtes du Rhône Villages under then name Vaison-La-Romaine, a tourist delight in the middle of the Vaucluse where we stayed on holiday for a couple of days back in '99. Vaison is not actually one of the 16 villages and Texier doesn't quite state as much on his bottle; he just intimates it. But then, if he didn't state the village, the wine could have come from anywhere within the four departments of the southern Rhône. That's Texier's attention to detail  and his sop to sad anoraks like me, who buy and consume wines because they're one of a kind or they're from an area we've visited and loved. Texier's wines are all bottled unfiltered and unfined and are not limited to the Côtes du Rhône-Villages; he's gained significant attention for his Châteauneuf du Papes, both reds and white, and he bottles a white Côtes du Rhône that is 100% Viognier. Texier has done as much as anyone to identify the individual attributes of the Côtes du Rhône-Villages appellation. And he's been kind enough to reply directly to my e-mails in the past. It's people like him who make this wine game so much fun.